Jessica (Carolyn Kearney) is using her dowsing powers on her Aunt Flavia’s (Peggy Converse) ranch. Despite the skepticism of a vacationer, Gordon (William Reynolds), Jessica locates a chest buried deep in the ground. Flavia’s hired help offer to watch the box until an archeologist can come to the ranch in the morning. Sleazy, Boyd (James Anderson) tricks dumb lunkhead, Mike (Charles Horvath) into opening the box. Much to Boyd and Mike’s surprise inside is ye olde hypnotic head of a Satanist named Gideon Drew (Robin Hughes). Gideon is desperate to be reunited with his body, and anyone who looks into his eyes is a slave to his will. 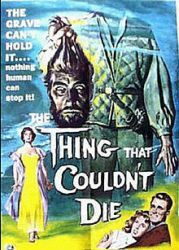 The Thing that Couldn’t Die was mocked on MST3K many years ago and justifiably so. It’s saddled with some terrible dialogue (“…I have strong hands…”), and performances that are weak (Jessica’s turn from put-upon water witch to bad girl is particularly bad). Presenting your evil severed head’s greatest victory while he’s peering out of a hatbox diminishes his menace a little bit. The villain archives his goal and is a menace for about three minutes before easily being put down. Despite all that, I find a compelling sense of dread permeates the film. The shadowy exteriors of the ranch at night are evocative. I also enjoy the idea of something old and obviously magical being contrasted with the modernism of 1950’s life. I wish that motif would have appeared more often in genre films from that era.